Can you benefit from dental lasers, specifically a Waterlase if you have periodontal disease? Patients are researching periodontal disease online and methods to treat all sorts of dental diseases. This blog will introduce the use of the Waterlase to treat periodontal disease. 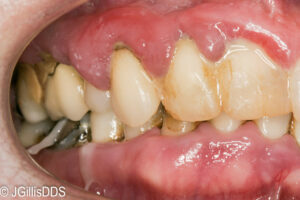 Severe gum disease and periodontal disease. Note swollen gums from accumulations of bacteria and bacterial toxins below the gums. You might have periodontal disease if you have bone loss around your teeth. Nearly 40% of the population has mild to moderate periodontal disease! Is one of these people you? 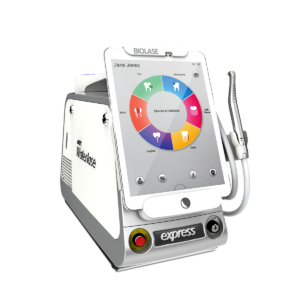 The Waterlase brings an innovative way to deliver periodontal treatment that is patient-friendly,, and does not require aggressive and expensive periodontal surgery with a periodontist. With the REPAIR protocol and a Waterlase laser, a dentist can treat your infected periodontal pockets without having to surgically reflect your gums from the teeth to clean around the roots. The Waterlase is not new but the advanced periodontal procedures and periodontal REPAIR protocol is new. Our office purchased a Waterlase several months ago to be able to offer this advanced level of comfortable care to our patients. Having periodontal disease is not a death sentence for your teeth! You can save teeth that have had some bone loss (periodontal disease) and with your help we can eliminate active gum disease (gingivitis)! When periodontal disease is properly treated with the Waterlase, we can actually improve the amount and strength of the bone and soft tissue around your teeth. Find out if your dental office offers this innovative treatment! Moderate gum disease and periodontal disease. Note swollen gums from accumulations of bacteria and bacterial toxins below the gums. You will probably need periodontal scaling and root planing which is sometimes called a deep cleaning. We love our office’s dental hygienists! Excellent home care of your teeth and gums. Our office will show you how! Following your dentist and dental hygienists recommendations for care. What is the Waterlase REPAIR process in understandable terms? The pockets measuring more than 4 mm with bone loss are first treated with the laser to remove the infected tissue and below the gums biofilm, crud and calculus (tartar). Biostimulation may be used to help with discomfort. Our office cares about you and your overall health. Treatment of gum disease and periodontal disease is not just about your teeth! Infection in your gums has been shown to negatively affect your whole body’s health. The time to take care of infections in the mouth is as soon as possible. You may not even know that you have infection, so please schedule a thorough exam with your dentist and then follow through with recommended care! We love helping our patients be as healthy as possible. Please call our Grand Junction, Colorado office at (970) 242-3635 if you would like to schedule an appointment or if you have any questions abut your care in our office.